Not able to tick items in SP Flash Tool after selecting scatter .txt file.How to check Boxes? You need to select a file to write each partition you want to select. Double click on the location column for the partition you want to write to and select an img file, e.g. twrp. Not the answer you're looking for? 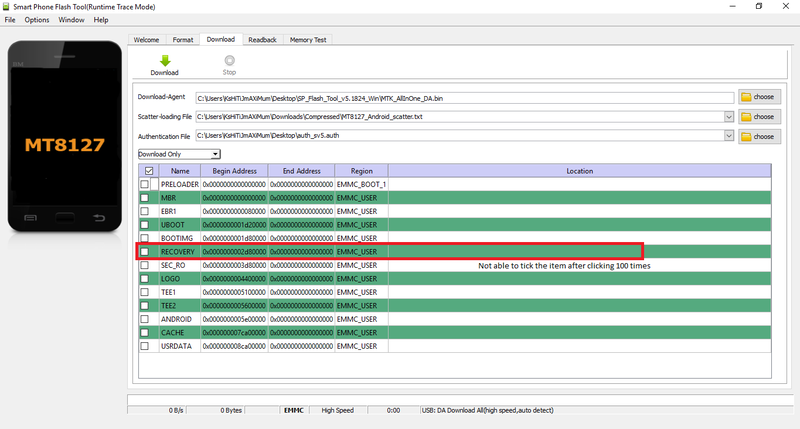 Browse other questions tagged rom-flashing custom-roms flashtool mediatek or ask your own question. (SP Flash Tool) Recovery.img file too large and causes region overlap message. Safe to Proceed? how to flash ROM in xolo opus3 with sd card? How to use SP Flash Tool to install a new Recovery? Alcatel One Touch pop C3: How to install TWRP?